Thanks to all of you who entered the Back to School giveaway!! And.....the winner is Kelly Shults!! I will email you Kelly ASAP with the units you won. Thanks again to all of you who took the time to enter and to Alessia for so graciously sponsoring the giveaway!! 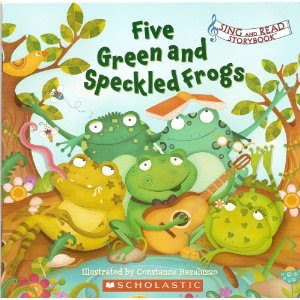 Thanks Frogs, Bees, & Under the Seas for you shout out to Mrs. Gilchrist. What a great blog discovery!! I LOVE all of the FREE downloads!! 10) This idea came from Shannon Keller. Instead of having just a writing center or a writing table.... have a Writing Bar in your classroom. 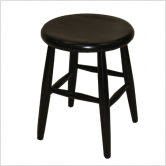 Use that large teacher desk that you don't know what to do anything with for the bar and instead of putting chairs around it, use short wooden stools. Use magnetic hooks to hang portable word wall rings and writing tips around the sides. Stock the top with all kids of writing materials and add a fun sign to advertise it. What a great way to add novelty to the writing center!! 9)This idea came from Deanna Jump. This is called "Don't Sink the Ship." 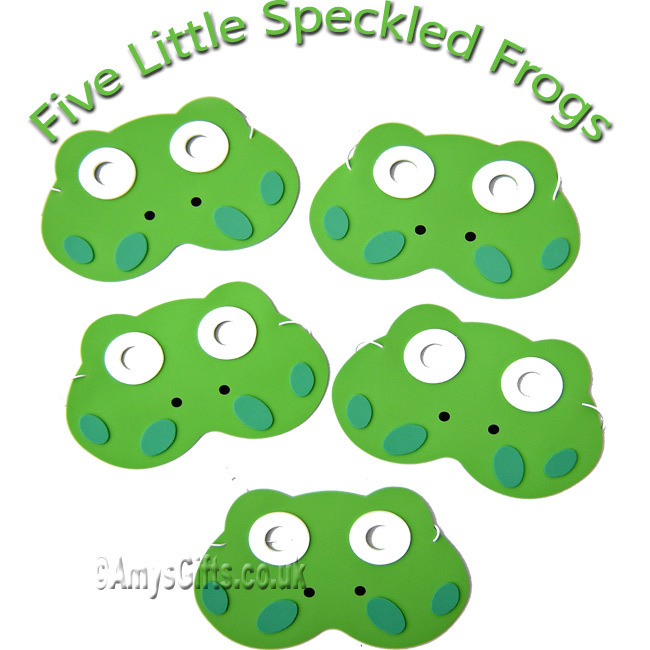 You will need a cookie sheet and 4 pirate ship cutouts (printed on cardstock) with magnets attached to the back. When you are teaching a lesson or reading a story and a child is talking while you are talking or causing some type of disruption, quietly remove one ship without saying a word. If someone complains out loud to the person who cost the class the ship, quietly take another ship off. When you are finished with the lesson, if at least one ship is left, sing a fun Dr. Jean song or do a fun chant. 8)This idea also came from Deanna Jump. Have carpet bags for your students when they go to the carpet for a lesson. Use the extra large zip-loc bags or a similar type bag. Suggested items for the bag include a marker, a pencil, a wipe board, and a journal or spiral notebook. When you are completing a graphic organizer or chart, have your students do it with you to help keep them engaged when its not their turn. Another item you might add to the bag are clipboards. An easy way to make cheap clipboards is to use a piece of heavy cardboard and a chip clip. Just attach the chip clip to the top of the cardboard. 7)This idea came from Lisa Maddox-Vinson. Bring water, reading, and retelling into your classroom. 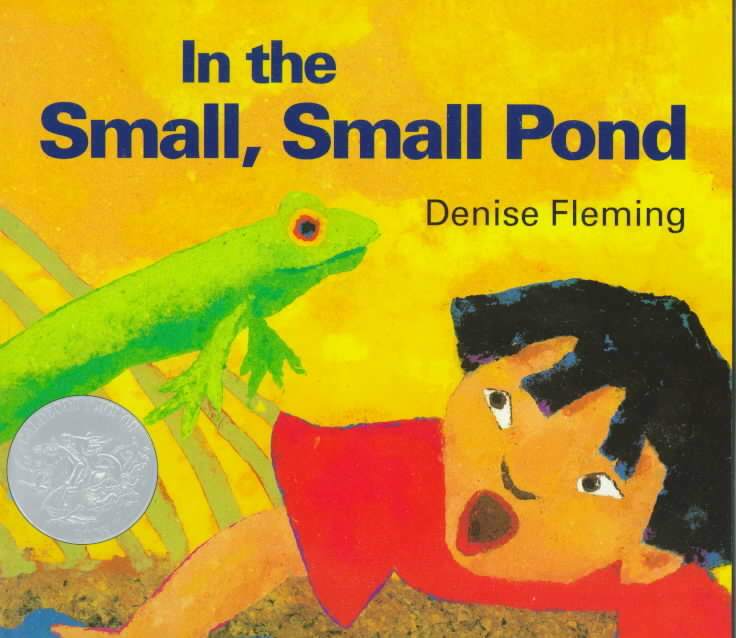 After reading frog and/or pond stories, put this water reading area together. Use a round blue vinyl tablecloth for the water. Add some frog hats for retelling props. 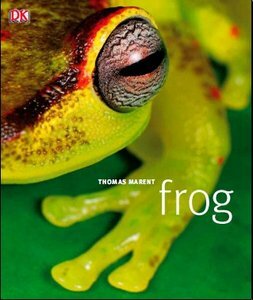 Place several copies of books about frogs and/or other pond animals. Add stuffed animals or additional hats for story retelling. 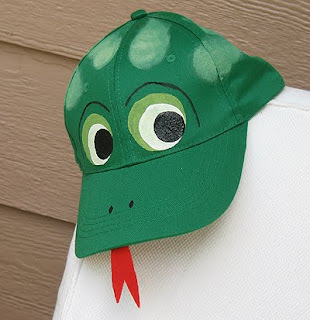 You can find the instructions for making these simple frog baseball hats from Crafts By Amanda. I found this felt retelling set on Etsy. 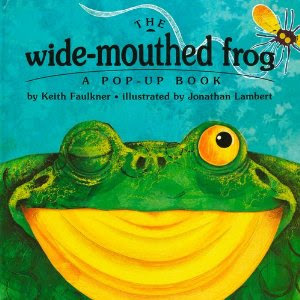 Here is a list of frog read alouds you can download. More frog ideas here. 2. Work with a partner. 3. Predict if your partner will grab MORE than 10 items in one handful.. FEWER than 10 items in one handful…. Or EXACTLY 10 items in one handful. 4. Grab the objects. Count the number and check your predictions. 1. Predict if there are MORE than 20 items, FEWER than 20 items or EXACTLY 20 items in the bag. 2. Use two ten frames to check your work. 1. Predict if there are MORE than 50 items or FEWER than 50 items in the bag. 3. Predict if there are MORE than 100 items or FEWER than 100 items in the second group of bags. 4. Use a 100 chart to check your answer OR make groups of ten. 5)This idea came from Deanna Jump. When creating schema charts with your class, make sure that every student realizes their thinking is valuable. First, give students a strong model. Except all of their ideas and write them on post-it notes to add to the chart. As new learning occurs, move ideas that were incorrect to the misconceptions box. For more information about schema charts, read Debbie Miller's Reading with Meaning and Teaching With Intention. 4)This idea came from Tom Glynn. Use Animoto to create slide shows of your students. Go to Animoto to get started. It's free and easy!! I put this video together of pictures I took over the week. It is just a quick example for you to look at. 3)This idea came from Dr. Nicole Andrews. Research has shown that having more advanced spatial skills is linked to better mathematics achievement, especially for females. A recent longitudinal study found that spatial skills in kindergarten were stronger predictors of ninth grade math school achievement than fourth grade math scores. 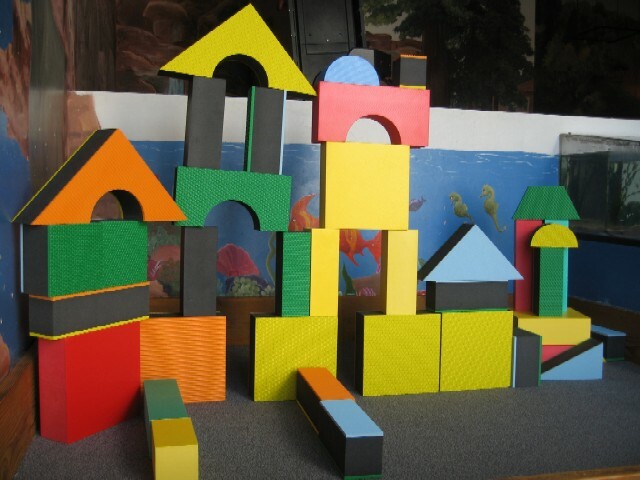 Spatial ability includes mental rotation, spatial visualization, and spatial perception. Meaning....students need to engage in lots of activities that help them to see what something would look like if it was rotated, see something and then replicate it, and read maps and be able to navigate space (hide something, give them a map, and see if they can find it). Block play is STILL IMPORTANT!! You need the block center and lots of activities that involve building things, making maps, and experimenting with perspective in your classroom. I have lots more to share on this, but I am saving it for a post on its own. In the post, I will share specific lessons for increasing a child's spatial abilities. 2)These ideas came from Brooke Perry. Check out Brooke's CAMT post. 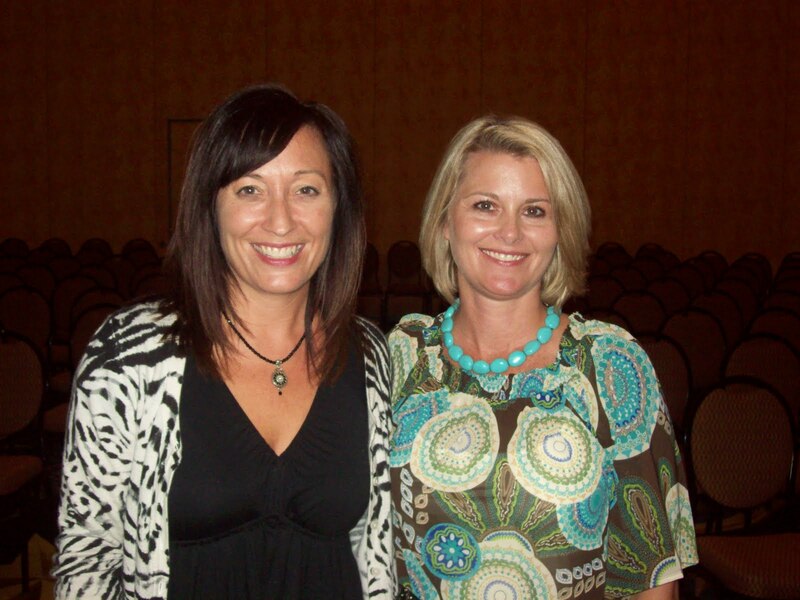 She has a download of her presentation "Making Every Minute Count Using Literature to Teach Math". 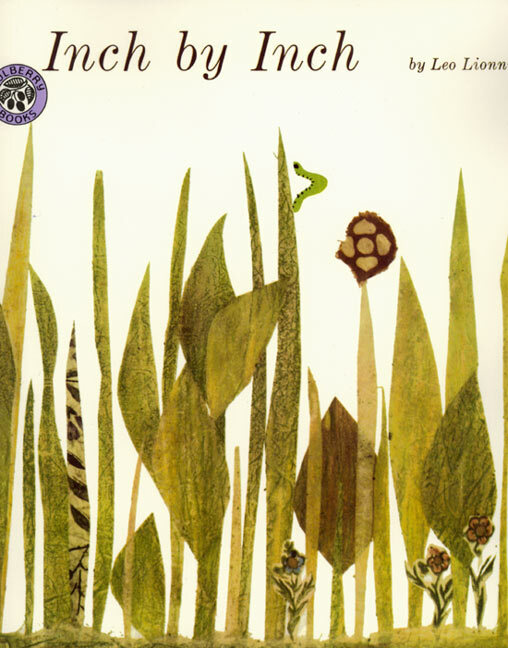 You will find TONS of great math connections to literature in Brooke's download. 1)This idea came from Donna Glynn. Donna has TONS of great math activities for teaching number sense, addition, subtraction, odd and even, etc. Here are a few pictures I took from Donna's session, but she has so many more games and activities than what I have pictures of. You can find all of these activities and many more from her TPT store. A few that I really liked were Building Numbers, Bump, Clear the Board, Cookie Jar Greater Than Less Than, Double Dice, Find the Sums, High and Low, Odd and Even, Roll and Record, Show the Value, Tally to 100, and Yatzee. It was a GREAT week!! I have LOTS of FUN ideas and lessons to share with teachers and students now!! I can't wait!! The true highlight of my week though.... was finally getting to meet Deanna!! I wanted to share a Pete the Cat deal I just found out about. It's Bookperk'sPerk of the Day. 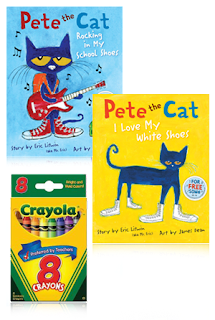 For $19.99 with FREE shipping, you can get a hardcover of Pete the Cat: I Love My White Shoes and Pete the Cat: Rocking In My School Shoes, and a box of Crayola crayons. This is a little bit better of a deal than you can get on Amazon because of the free shipping. The offer expires August 4th. Bookperk is a division of Harper Collins. I know how we are all FONT CRAZY!! and especially when we find FREE fonts!! I installed TONS of cute free fonts this morning from Miss Tiina. Awhile ago, I made a "Back to School Ideas" post. Someone emailed and asked for the page for the Chrysanthemum lesson. The idea actually came from Brooke Perry, but I recreated the sheet to send so I thought I would share it. Looking for easy and cheap positive incentives to use in your classroom?? Then check out Sarah's post Best "beehavior" Catalog. You will find some super fun, easy, and cheap ways to reward your students. 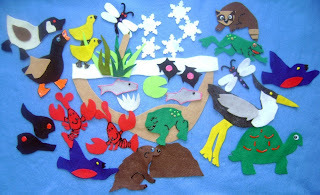 I just found a new crafty blog with tons of great connections to children's literature. It is called I Heart Crafty Things. There are tons of pictures and step by step examples for the projects. You will love it!! Based on the book "Piggies" by Don and Audrey Wood. 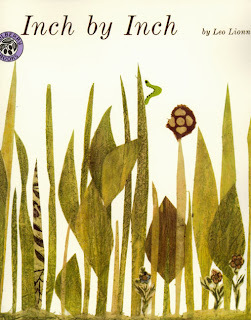 Based on the book "The Very Lonely Firefly" by Eric Carle. Based on the book "This Little Pirate" by Philemon Sturges. Would work great with the books "Centipede's One Hundred Shoes" by Tony Ross or "Speed, Speed, Centipede: Counting by Tens" by Michael Dahl. I am sad to say that the winner of the Literacy Center and Guided Reading Pack giveaway did not leave an email and has not responded to my post, so..... I have chosen a new winner!! Through another random drawing, the NEW WINNER is Deedee Wills from Mrs. Wills Kindergarten!! Congrats Deedee!! I will email you are goodies ASAP!! I am working on the top ten ideas I got from my week of conferences (If I can narrow it down to just 10). I will post it as soon as I am done!! Also, Katie, a first grade teacher from Austin, has just started a blog where teachers can ask and answer questions for one another. I thought this was a great idea and could prove to be a valuable resource for many of you. Check it out at Teachers Ask, Teachers Tell. Literacy Center and Guided Reading Pack Winner!! Congratulations Samantha from Ms. Beattie's First Grade!! You are the winner of the literacy center and guided reading pack giveaway!! Email me so that I can get all of your goodies to you. Thanks again to the ladies at Lesson Plan SOS and Kindergartenworks and to Deanna Jump and Julie Lee for so graciously providing their products for the giveaway!! Thanks also to everyone who entered. I really enjoyed reading your suggestions. 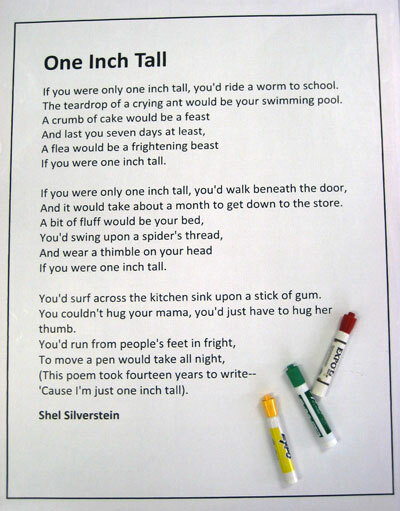 Based on the poem "One Inch Tall" by Shel Silverstein. 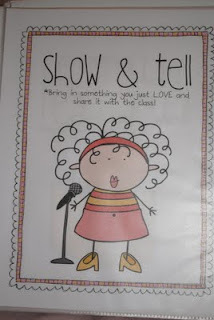 Write the poem on a large sheet of chart paper or print out as a poster. For younger students, you may want to add picture clues. Have students act the poem out as they read it. This can be done by each student taking a different line or by everyone doing it all together. Have students brainstorm a list of things they could do if they were one inch tall. 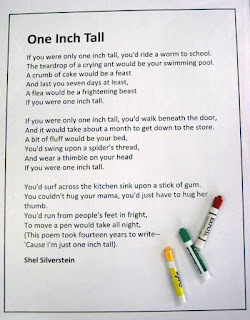 Then they can finish this sentence and illustrate it - "If I were one inch tall __________." Give students small pieces of pipecleaners cut to one inch. Have them measure objects in the classroom and see how many inches tall they are. Have a discussion about how we usually grow taller as we get older. Make some comparisons between students in the class, those in older grades, and adults. Discuss how there are things we can do as we grow taller that we could not do when we were shorter. Inch by Inch by Leo Lionni is a good companion book for this poem. For a fun activity and free download to use with this book, check out this new blog I just found The Weekly Hive. 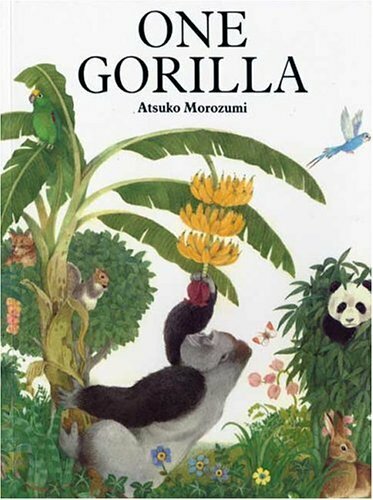 Based on the book One Gorilla by Atzuko Morozumi. As you read the story have the students use counters to show how many things the child loves on each page. For example: two butterflies and one gorilla. The students should show two counters for the two butterflies and then one for the gorilla. That would make three things that the child loved. Since the one gorilla is added to each page, this will give additional practice for adding "one." If using Unifix cubes, the students can stick them on their fingers and hold them up for you to check for understanding as you continue to read the story. Next have the student think of something they love. They will illustrate their idea and fill in the sentence frame: (Name) loves (number) (what) and one gorilla. Tips for helping students draw a gorilla. I spend the first half of the year teaching my students how to draw as well as read and write. I walk them step by step through how to draw anything we do. It takes a little time at first, but then they get better and it goes faster. The idea is that by adding more detail in their drawings, it will carry over to their writing. For teaching my students to draw animals, I usually look at how TLC Lessons makes the animal. Then I recreate it using mostly basic shapes. Here is an example of the TLC gorilla in the zoo book. 1) For the body, have students make a large black oval. 2) Add arms and legs, have students make 4 black ovals (as shown in the picture above) then add 4 small brown ovals for the feet and hands. Use a black crayon to add details. 3)For the head, have students draw a large black circle, but not color it in. Have them add 2 black half circles on either side of the head and color them in. 4) For the face, have students add a large brown circle for the nose and two smaller brown circles for the eyes. Then have them use a black crayon to add details to the eyes and nose. 5) Have students color in the rest of the face black. I had not seen this before, but it makes a great measuring and comparison lesson. Go to How to Pass Your Body Through a Sheet of Paper for step by step instructions on how to cut the piece of paper. Ask students if it is possible to walk through a sheet of paper. Of course they will tell you "no." Follow the instructions and cut a regular sheet of copy paper so that you can pass through it. Have students talk about what they noticed and why they think the way they do. Ask them what will happen if you cut a larger sheet of paper. Have them make predictions and discuss why. Cut a large sheet of chart paper so that you can walk through it. How did it change from the small sheet? Why? Ask kids these questions. Have them make predictions about how many classmates will fit through it. Check your answer. You can find printable instructions from Family Fun. 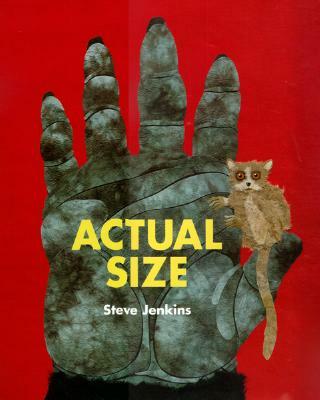 These measurement ideas are based on the book Actual Size by Steve Jenkins. Buy two copies of the book- one for reading and one for taking apart. Carefully remove the pages from one of the books. Tape them together and laminate them so students can lay them out flat and use them for measuring. Put small colored sticker dots in various places on the picture to show students where to measure. Give students a variety of objects for measuring- pom pom balls, Popsicle sticks, pipe cleaner pieces, counters, etc. I would not have students lay all of the objects out at once like this, but I wanted you to see the different items I used for measuring. Have different groups measure the same picture using different items. Have them make comparisons and discuss their thinking. This is a great activity to place in a math tub after the lesson. This is my favorite idea to use with the book. Make copies of the gorilla hand. Have students paint their handprint inside a copy of the gorilla hand. Then have them make comparisons between their own hand and the gorilla hand. For fun, have some people outside of the classroom make a handprint. For example, the principal, a parent, a high school football player, etc. If I did this with my class, I would place labels with the child's name on their page, laminate them, and bind them together to make a class book. Students can make comparisons between their hands, a classmates hand, and the gorilla hand too. The really large orange handprint came from a Tech football player. The kids had tons of fun with that!! Mamie Tice shared this great idea in her CAMT session. This lesson is a great way to teach young children about portion size in a hands on and meaningful way. You could use this idea with a unit on food and nutrition or a study on measurement. Download several copies of the book "A Serving of Food is Fun". I have included the downloads in this post for your convenience. You can find the downloads on the Texas Department of Agriculture Site. Put together a basket of the items that represent the serving sizes of food we need each day. 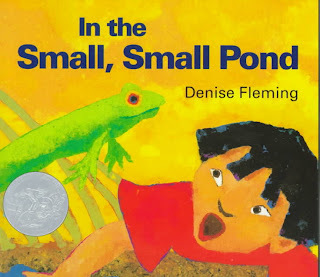 After reading through the book with students, have them work in small groups to explore the book and the size of the items in the basket. Encourage them to make comparisons and share what they learned. I got inspired by Brooke's great presentation at CAMT and decided to put together some math activities for using the book Fish Eyes to teach number sense and addition. Be sure to check out Pam at Can Do Kinders. She just started a new blog and is already offering a few free downloads. We used to sing TONS of songs in my classroom, so I had to join Miss Kindergarten's musical linky party. Here are a few of my favorites!! 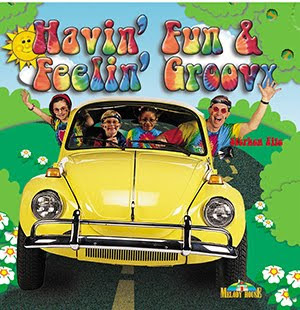 My favorite days of the week song is Stephen Fite's Seven Days a Week off of his Havin Fun & Feelin Groovy CD. It is to the tune of the Beatles' song Eight Days a Week. Really.... all of Stephen's songs are FUN!! 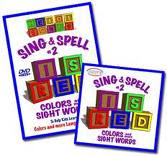 My favorite color word songs are from Heidisongs Sing & Spell Volume 2. My kids love these songs and they really help them to learn how to spell the color words. Mr. Al is one of my favorites too!! 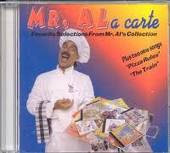 I love his Mr. AL a carte CD. 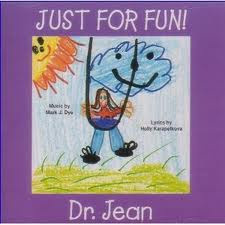 There is a fun color song on the CD as well as a song called Rock-n-Roll Body Parts. The kids always love this one!! You will find a great good morning song on this CD too. Hap Palmer is great too!! I love Colors, Put Your Hands in the Air, and March Around the Alphabet. My favorite song to learn in October.... Withes Brew. Sally the Swinging Snake is super fun to sing with the letter S.
Thomas Moore is a favorite too. My favorites are The Pig and the Pony and Humpty Dumpty, but I really LOVE every song on this CD. 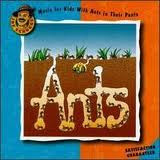 And my favorite Joe Scruggs song is Big Underwear from the CD Ants. I actually have all of Joe Scruggs' CDs. We listen to them while we work. 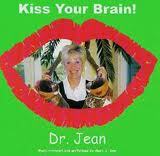 I also use LOTS of Dr. Jean in my classroom. Kiss Your Brain and Just For Fun are two of my favorites! Yah! A Couple of New Blogs to Me!! 1000 Followers and a Giveaway!! A New Favorite Unit!! Color Day Fun!! Time to Vote For Your Favorite Blog!! All of My Blogs Are Sorted Now! !